When I’m feeling stuck, I’ve been taking a “meditate and trust the message to come” approach (my lower three chakras are notoriously sticky, word-wise). So far, it’s worked, albeit in its own time. This week, the vision that came for me after just such a meditation hit while I was about to get up from the toilet (I’m finding humor, here, as it’s become evident, again and again, that I don’t get to choose when/where these happen!). It was one of those “brick wall – you’re not going anywhere until you witness this” experiences. As the vision unfolded, I observed a volcano emerging from the depths of the sea, growing larger and stronger as the lava flowed from the heart of Gaia, cradled by the water, even when it raged and swirled – a supporter and protector – cooling and teaching – giving itself to mist in service, knowing that the ether would return it in time. 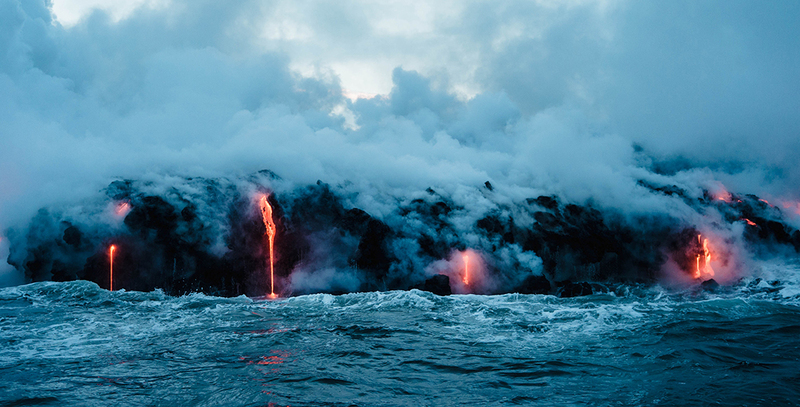 The fiery lava was an intensely powerful voice that would not be silenced. Her message was too important and coming from a place that held only truth, even in its violence. Heart fire. Letting go. Innate knowing. Rising up. Manifesting. The hardening rock that formed the surfacing mountain stood as a steadfast beacon of that which holds us all and also lives within. Somehow, I was feeling into all of it – earth, water, fire – as though my cells held this memory and the wisdom of it. A balancing of all three lower chakras – an emergence of what can feel like violent but passionate truth – the support of Gaia on this journey in oneness with her. All this tied to the chakras above, teaching about strong foundations upon which the others might live and thrive.